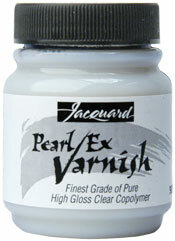 Water based Pearl Ex Varnish can be used as a medium or as a top coat with Pearl Ex Pigments. Works great on paper, clay, metal, wood or plastic and cleans up easily with water. This varnish enables Pearl Ex users to create their own lustrous metallic paints, glazes and durable finishes on every surface.